Fall is the most bountiful time of the year! Why: To have access to the freshest, most delicious produce for preparing healthy Fall meals. We will be offering a Fall CSA again this season! We were not able to offer our Fall CSA last year, due to the unprecedented drought but we’re excited to bring it back in 2019! We are happy to have the CSA deliveries continue into December to keep our Members’ kitchens stocked with fresh and seasonal produce as the days grow shorter and colder and the snow begins to fly. With that said, we are planning for Fall and Winter production, think comforting storage crops from the cellar and sweet delicious roots and greens from the field and greenhouses. This 10-week share will run October through mid-December and will be limited to 40 Members this season. It is important to remember as the months get colder and snow begins to fall, growing produce in our climate becomes more difficult and therefore riskier. As always, we could have crop failures but we will do our very best to grow you all the most delicious veggies we can. We built a couple moveable tunnels in 2017 and will be adding one more this Spring to provide more covered growing space for fall and winter crops. The weather varies so much every fall, we’re curious to see what 2019 brings. The Fall months are my favorite when it comes to the harvest and the produce available. The days begin to grow shorter, allowing us more time to be inside preparing meals and taking care of ourselves and each other. It's when we begin to see more sleep and rest coming... which keeps us motivated to harvest the heavy crops and put them in storage. There's a lot of heavy lifting that happens around here in October. 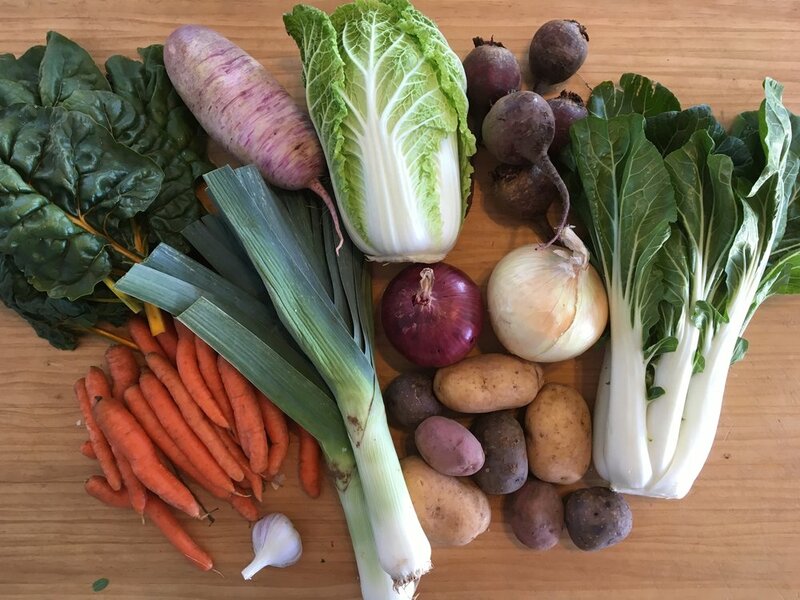 Fall brings so many flavors and endless possibilities in the kitchen and the Fall CSA will provide you with a bounty of veggies for warm cozy meals. Where: The Fall CSA Shares will be available for pickup once a week at the farm and in Telluride. The exact pickup time and location in Telluride are TBD. When: The Fall CSA is scheduled to start on Wednesday, October 9th, 2019 and run through Wednesday, December 11th, 2019. Please note, we schedule the Fall harvests and deliveries based on the weather and if a cold snap or snow storm is rolling through the pickup date may fluctuate a few days. I grew up in Colorado but am still terrified of icy roads and driving over Lizard Head Pass during a snow storm. Cost: The Fall CSA Share costs $35 a week, which comes to a total of $350 + applicable sales tax. Payment can be made online or by check once Fall CSA Registration opens on July 1, 2019. Join our Fall CSA Waiting List!